Rex Tillerson is making a great case for himself as worst secretary of state in modern history. Rex Tillerson’s nonsensical explanations for hamstringing his own department only made things worse. Secretary of State Rex Tillerson speaks to the media on Nov. 20 in Washington. Rex Tillerson just took another stab at winning the contest for Worst Secretary of State in Modern History. The occasion took place Tuesday at the Woodrow Wilson Center in Washington, D.C., where he delivered a speech bubbling over with boilerplate, interesting only for his warnings of Russian aggression and his touting of America’s allies as our most vital strength—both sentiments at odds with those of his president, a sign of his scant influence within the administration. The eyebrow-raisers came during the Q&A session, when he was asked to explain the sharp reductions in the State Department’s budget and the hollowing-out of its diplomatic corps. Tillerson replied that the cuts are “reflective of an expectation that we’re going to have success … in getting these conflicts [around the world] resolved” and, therefore, won’t need to have so many officials dealing with them. This may rank as the silliest comment ever made by a Cabinet secretary. First, as an old saw has it, hope is not a strategy. Merely expecting that you’ll resolve the world’s conflicts is not a valid reason for cutting programs and personnel that are currently needed for managing those conflicts. Second, anyone who thinks that any Americans, much less those on Team Trump, are going to solve this world’s conflicts has no understanding of history or politics and thus no business being anywhere near the State Department, much less running the place. Third, even if his expectation wasn’t a fantasy, there’s no way Tillerson or anyone else could even come close to solving the world’s problems without a functioning State Department and a well-stocked diplomatic corps—those things Tillerson and Trump have eviscerated. Then Tillerson muddled the picture further. After explaining why he slashed the budget and ranks of his department, he denied that he’d done any such thing. Yes, he said, the administration seemed to be requesting a drastic cut in the State Department’s budget (a cut of 31 percent, to be precise), but that’s only because in 2016, President Obama boosted the budget to “a record high” of $55 billion, way above normal levels. Trump, he said, is simply returning to a “sustainable” status quo ante. This is simply a lie. 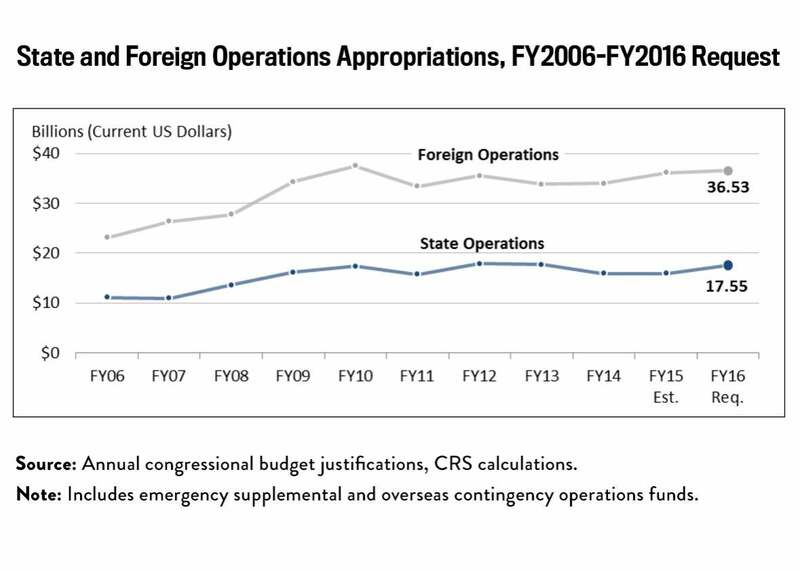 Here, from the Senate Foreign Relations Committee, is a graph showing the budgets for the State Department’s operations. Spending has been climbing since 2006 (and a larger chart would show the trend dates back to 2001, for obvious reasons), but 2016 saw no appreciable rise from the years before. The Trump–Tillerson budget is an unambiguous drastic cut. Funding for State Operations and Foreign Operations accounts. Tillerson also disputed the charge that he and Trump are hollowing out the department’s ranks. Rather, he said, he is putting the building through a “redesign,” which sometimes sparks disgruntlement. He didn’t mention—nor did his interlocutor, Woodrow Wilson’s much-too-polite president, Jane Harman—that Maliz Beams, the senior official he appointed to direct the redesign, had quit her job just the day before. He acknowledged that the “confirmation process” to fill second- and third-tier positions at State “has been excruciatingly slow,” but this too is misleading. The problem is not with the Senate’s pace of confirming nominees but rather with Trump’s failure—in many cases, apparent refusal—to nominate candidates in the first place. Of 153 State Department positions that are nominated by a president, Trump has left 76—almost exactly half—unfilled; almost a year into his term, he hasn’t nominated anyone for those slots. These include most of the department’s policy-related jobs, including the undersecretaries for political affairs and international security affairs as well as the assistant secretaries for intelligence and research, politico-military affairs, conflict and stabilization operations, international narcotics and law enforcement, population refugees and migration, African affairs, East Asian and Pacific affairs, Near Eastern Affairs, South Asian affairs, Western Hemisphere affairs, and many more. Tillerson tried to paint these vacancies as irrelevant, saying that the acting assistant and undersecretaries are doing a fine job and that anyone who harps on this issue are insulting their professionalism. But he is missing, or evading, the point. Officials in these positions conduct the everyday management of U.S. foreign policy. They have to convey to their counterparts in other agencies, and especially in foreign governments, that they are acting and speaking on behalf of the president of the United States. Yet because these acting officials—some of them junior holdovers from prior administrations—are unable to do this, they aren’t taken seriously. The fact that Trump hasn’t filled these slots also sends a message to allies and adversaries that he doesn’t take those jobs, or their responsibilities, seriously. Trump has confirmed this message in several ways. When Russian President Vladimir Putin ousted 755 American diplomats from his country, Trump thanked him for cutting the U.S. payroll. When a Fox News anchor asked Trump about the empty slots, he replied, “I’m the only one who matters”—reflecting no understanding of how foreign-policymaking works. 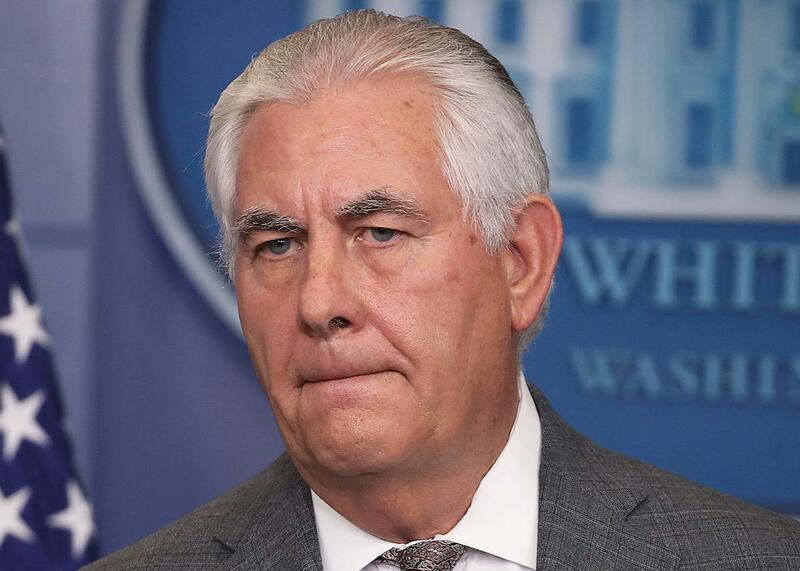 Finally, Tillerson acted as if he hadn’t recently offered $25,000 buyouts to entice nearly 2,000 diplomats and staff to leave their jobs—an offer that many are taking amid a crisis of morale, as many experienced specialists sit at their desks all day with nothing to do. In a New York Times op-ed piece published just hours before Tillerson’s speech, Nicholas Burns and Ryan Crocker, two of the nation’s most decorated ambassadors (both retired), decried Trump and Tillerson’s steps as setting off what may be the “greatest crisis” in the foreign service’s history. And the crisis may deepen: The number of young Americans applying to take the foreign service officers’ entry exam has plunged this year by 33 percent. There’s no future in American diplomacy—that’s the message that Trump’s actions have sent, and Tillerson, the nation’s top diplomat, recited it explicitly in his Q&A.